It was not cold the night Jesus was born and there was definitely no snow. If there had been snow the shepherds would not have been outside and Mary and Joseph would not have found an empty stable. There was a census on, but not to count people, for that type would have been taken with people at home. The census taken was of the Roman Empire and was a registration of land in view of property taxes to be paid. Joseph must have had property near Bethlehem and had come to have title deeds secured. There were infiltrators everywhere and the situation was tense. The bureaucratic attitude of officialdom liked to use the small power given to it by sending people from pillar to post. It was in this world that Jesus was born in the fevered turmoil of human affairs – land disputes, land ownership, registration and tax forms! "A CHILD HAS BEEN BORN FOR YOU!" By the grace of God given to us in our Baptism and Holy Communion we must give birth to Jesus within us, so others also hear the message of the angels. Then together we can help to reshape the world as God intends it to be. Last month I wrote about healing the living; this month I am writing about healing the departed. November is traditionally the month dedicated to the dead; nature is dying and the daylight hours are getting very short. This is why more Requiem Masses are said this month. those still living on earth. At death we leave our bodies and become discarnate spirits and go to Paradise – a garden or state of waiting. But Gethsemane has a part in this garden – a refining process whereby all that is against the will of God is taken away. We mature in Paradise towards Heaven to enjoy for ever the full presence of Our Lord. Personally I take comfort from the thought that after death there will be a phase of preparation before I meet Jesus face to face. To use a trite analogy, if I were to go to a wedding after working in a coal mine, I would rather have had a bath and changed into clean, smart clothes than turn up dirty in my working clothes, even though I know I am loved and accepted in whatever I am wearing. Prayers for the dead do not affect the salvation of the dead but they acknowledge they remain part of the community of faith in Paradise (also known as Purgatory). We are, in effect, continuing to show our love for them and I believe this is a tremendous help, too, to all who are bereaved. We pray naturally for our loved ones who are alive on earth and our Creed proclaims belief in the Communion of Saints –so this love is unbroken by death. 1. The mother-in-law is critically ill; it is a “high fever”. 2. “They asked him to do something for her.” This calls to mind St James’ words that a sick person or someone on his/her behalf has to do something – send for the priests (James Ch.5). 3. Jesus leans over her and rebukes the fever. Again St James’ Epistle comes to mind when he says the priest must pray over the sick person, so he or she is entirely surrounded by positive prayer. 4. She gets up and waits on them. When a community is healed the Gospel bears fruit and that is achieved by the same Spirit who cured Simon Peter’s mother-in-law. St Paul commends the church at Collossae for their “faith in Jesus; the love you have towards all the saints; your love in the Spirit.”(Col.1) When Christians are strong in love for one another, miracles can be expected. ministry of healing, particularly in James Ch. 5: “If one of you is ill, he should send for the elders (priests) of the church…” The sick person, or someone on his behalf must do something; in the case of Simon Peter’s mother-in-law it was relatives and friends. Jesus is always the priest par excellence, because when we anoint with oil we do it in His stead and name. St James tells us it is the “prayer of faith” that saves the sick person and in this story we see the result of that prayer of faith, for she was well again. Which I offer to the Lord . . .
For want of a rider a battle was lost. We shall not lose our church for want of friends, but we could always do with more and each individual does matter. According to Canon Law (the rules of the Church of England) all priests are to say Morning and Evening Prayer daily in church and to ring the bell, irrespective of whether any congregation attends. I have done this daily (except when on holiday) ever since being instituted as Vicar. 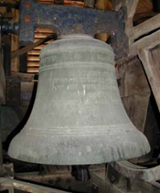 The bell is rung 33 times. This represents the 33 years lived by Our Lord on this earth and the priest is continuing this ministry. 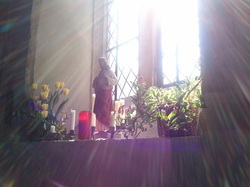 Morning Prayer is usually said at 9.00 and Evening Prayer at either 4.00pm or 5.00pm. The times are on the porch notice and anyone is welcome to come. Each Night at Night Prayer (Compline) the Church prays “May the Lord grant us a quiet night and a perfect end”. The ‘perfect end’ refers to the moment of death. This month we celebrate Mary’s death and entry into glory – the Feast of her Assumption into Heaven. There is an old story about natives who seized a shipwrecked sailor and took him to their village, where they made him king. He then learned his fate: he would be king for a year, then taken to a barren island to be left as an offering to the gods. The sailor quickly devised a plan. As king he ordered carpenters to build a boat, farmers to plant gardens on the island and builders to construct buildings! Although this is only a story, it is a good illustration of the Christian life. Like the sailor we know our future and should be preparing for it. It is all too easy for us to be caught up in materialism which smothers our spiritual lives. Everything we own today will eventually belong to somebody else and however well we care for our bodies, we cannot stop them growing old and dying, but our relationship with God, which is shaped over a lifetime, remains with us through life, death and into eternity. "We know that by turning everything to their good God co-operates with all those who love him, with those that he has called according to his purpose…He called those he intended for this; those he called he justified and with those he justified he shared his glory." May we all follow Mary’s example. God the Son is our redeemer. But to live God’s life we need God’s life in us and that is the Holy Spirit to energise us. Without this life we would be like the apostles immediately after the Crucifixion – behind locked doors, afraid, timid and unsure. So God sends us His Spirit – God the Holy Spirit. How do we experience the Holy Spirit? Jesus says: “The Holy Spirit is given to those who ask.” But it is not just a matter of asking – we must also be open to receive. not believe me. This shows why we so often do not receive the power of the Holy Spirit, because when we do ask, we doubt God’s word that we will actually receive it. There is a beautiful Russian ikon of the Holy Trinity depicting 3 divine persons sitting at a table with a dish of food in front of them. The thing that should strike you about the ikon is that there is a vacant place. This is meant to convey openness, hospitality and welcome, particularly to the outsider. The vacant place is meant for you and me, for it is God’s invitation to us to share the life of the HolyTrinity. God made us; He lost us; He redeemed (bought us back) us in Jesus and He breathes His life in us by the power of His Spirit if only we ask and receive. This month is dedicated to the Sacred Heart of Jesus, the heart being a symbol of God’s great love for us. So many people suffer from guilt, which is self-punishment or self-hatred and is often completely out of proportion to the sin which brought it about. The fact is that no matter what a person has done, his or her value as a person is not impaired. God still loves us as much as ever and the guilt-ridden person needs to regain a sense of self-esteem. The first thing we need to learn is that we are beautiful because we have been made in God’s image. The second thing is that, although we are beautiful, we are fallen, for none of us is perfect. All of us are ‘streaky’. So often our sinfulness makes it impossible for us to see other people as they really are and we never get beyond the fallen surface. All too often we make the ocean our sins and God’s love the handful of dust. In God’s eyes we are all beautiful in spite of being ‘streaky’. My theme in this year’s Annual Report was "Thanksgiving". Thanksgiving for the redecoration of St Mary’s which is transformed into a bright and welcoming church. 2012 has seen, too, the restoration of the clock in the tower. Thanksgiving for the excellent relationship with Mendlesham School. Mrs Claire Jones has been a source of encouragement in regular school assemblies and special services in church for Easter, Harvest, Remembrance and Christmass. Thanksgiving for the Church and Town Estate Charity that has helped pay our insurance and heating bills, heavy this year not only because of a cold winter but the problem of drying out the plaster. Thanksgiving for the work on our website that has made our church much better known. Thanksgiving for all the fun and fellowship we have received in our "Teach-in" courses on the Mass in St Joseph’s Centre – for the wonderful meals and all who have supported them. Thanksgiving that Jeremy Lind has been to an ordinands’ conference and is beginning an exploratory process for training for the Sacred Ministry. I remember a bishop saying churches want priests but do not grow them in their own congregations; let us pray for a good outcome. Thanksgiving that we are able to maintain our congregations when so many churches are in decline. Thanksgiving for co-operation of the Parish Council and PCC to resite the American War memorial in the churchyard, the obvious place for it. Thanksgiving for former members of our congregation who have left their mark on St Mary’s but have passed to another shore: Terry Spalding who did so much to get St Mary’s respected in the deanery and Bamse Harvey-Samuel, who valued St Mary’s so much, for both its churchmanship and sanctity. May they rest in peace. Thanksgiving for our wonderful Assumption Festival in August, with its concerts, festival Mass, fireworks and blessing of beer. Bishop Norman so enjoyed it that he has invited himself to preside again this August! Thanksgiving for the ‘Friends of St Mary’s’, whose tireless fundraising has contributed greatly to our restoration plans. They have organised a varied programme during this last year: refreshments for armoury visits, outings, talks in church varying from James Grinter’s talk on antiques to Roy Tricker’s "Enjoying churches"; quiz evenings, coffee mornings, a baked spud day and strawberry teas. A very big "thank you" to them. But last, any by no means least – a big "thank you" to all. I believe St Mary’s is alive, friendly and exudes with fellowship and Anne and I are grateful for all the love and care we receive. In St Luke’s account of the Resurrection, when the women came to the tomb the stone was already rolled away. Here we have one of the discrepancies in the accounts of the Resurrection, of which the critics and opponents of Christianity make so much. In Mark’s account the messenger in the tomb is a young man in a white robe; in Matthew’s he is the angel of the Lord (Matt 28 v 12) and in Luke it is two young men in bright clothing, whereas in John it is 2 angels. It is true that there are differences, but it is also true that, whatever the minor details, the basic fact of the empty tomb never varies and it is that fact that matters most of all. No two people ever describe the same incident or episode in exactly the same terms. That is the case about the descriptions of the wonderful event of the Resurrection of Christ. As it was told and retold by word of mouth, inevitably certain small details changed. But at the heart of the story is the truth about the empty tomb. The women returned from it to tell the rest of the disciples, who refused to believe them. They called it an idle tale and only Peter and John went to see if it might be true– and they found that it was. Jesus is not dead, but alive. He is a living presence today and someone to be met and lived with every day in life. He is not only a historical figure in a book but as real as he was 2000 years ago. Easter is a celebration that Jesus is truly alive. The Paschal (Easter) candle in church at the entrance to the Chancel is a symbol of the Risen Christ and the Church proclaims the same faith as those disciples who went to the tomb. That life of the Risen Christ is given to every person who has faith. Obviously we can’t witness the empty tomb in the same way as the first disciples and we have to rely on someone else’s testimony. Their lives prove the Resurrection, because after it they were totally transformed. The previously disloyal Peter could stand up in public and address the crowds with confidence; he later gave his life in martyrdom for the Christian faith. The other apostles were similarly changed. The Paschal Candle speaks of eternal life - that is the Risen life of Christ NOW, which we are all invited to receive and make our own. It also speaks of everlasting life – that is life beyond the grave, to which we commend our departed brothers and sisters. Chist has died – Christ is risen – Christ will come again! The Cross is at the centre of the Christian faith and speaks of our need of forgiveness. We often see notices in buildings which state: “For Members Only” or “Staff Only”. On the Cross, God’s notice is “For Sinners Only”. The Cross speaks of forgiveness to all those who turn to Christ. Two people went through school and university together and developed a close friendship. They went their different ways and lost contact. One became a judge and the other followed a life of crime. One day the criminal appeared before the judge in court. Having committed a crime he pleaded guilty. The judge recognised his old friend and faced a dilemma. He was a judge and so had to be just. He could not let the man off. On the other hand he did not want to punish the man because he loved him. So he told his friend he would be fined the correct penalty for the offence. That is Justice. ...But having pronounced sentence the judge came down from his position and wrote a cheque for the full amount of the fine. This is an illustration of what God has done for us on the Cross and explains why the Cross must be at the centre of our lives. In God’s justice He judges us guilty because we all sin, but in His love He comes down to us in the person of Jesus – who is God made Man – and pays our penalty. This is the message of the Cross, where God’s Love and Justice meet. May we embrace Christ’s cross, give thanks that it is there that His love and justice meet, and try to show that same love and justice ourselves to those whom we meet. With a very early Easter, Lent is inevitably beginning in the middle of February. Ash Wednesday is on 13th February. LENT comes from the Anglo-Sason word for Springtime. It was introduced by Pope Felix III in the fourth century and lasted 36 days, but four more were added in AD487 to make up the 40 days Our Lord spent in the wilderness. ASH WEDNESDAY officially begins Lent. 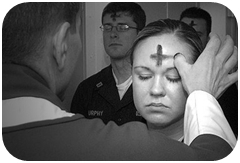 At Mass that day, ashes from burned palm crosses saved from the previous year are placed on people’s foreheads in the form of a cross. This is an ancient Biblical custom of showing we are sorry for our sins (see Jonah 3 v 5-9; Jeremiah 6 v 26; 25 v34; Matthew 11 v 21). The words used are: TURN AWAY FROM SIN AND BE FAITHFUL TO THE GOSPEL (Mark 1 v 15). LENT is a penitential season with purple vestments and altar frontal in church. These signs must not be simply external. When we are sick, it is so much easier to have a prescription for a tranquilizer than to probe the dis-ease of our sinful souls. A real cure for illness necessitates delving beyond symptoms into its roots to find its cause. LENT calls us to a change of heart. The weeds in a garden are not eliminated by clipping their leaves but digging them up by the roots. Alfred Nobel was shocked to read that his death had been mistakenly reported in a newspaper. What shocked him most was the obituary describing him as someone who had devoted his life to making weapons of war. That day he resolved to turn his energies in a new direction: working for world peace and human betterment. The Nobel Peace prize is his lasting legacy. Leonardi da Vinci had a terrible fight with another man whilst painting The Last Supper and when he went to his studio to paint the face of Jesus he could not make a single decent stroke with his brush. So he put it down, went to the man with whom he had fought and asked his forgiveness. He then returned to his painting and completed the face of Christ. A Michigan newspaper carried a story about a light bulb that had been burning day and night on a porch for 35 years. An electrical engineer speculated that early bulbs had strong filaments, which may account for the bulb’s longevity. The Gospel for Epiphany recalls another light that has been burning day and night for 2,000 years – the light of the star of Bethlehem that points to Jesus, the Light of the World. Does the light from the star of Bethlehem burn as brightly in our hearts as it did 5 years ago?...10 years ago? found an alternative route to avoid passing through Herod’s territory. But the “other way” might also mean they returned home transformed by their encounter with Jesus, living their lives differently from before. I hope this is our post-Christmass experience, too. The traditional names of the Magi, C(G)aspar, Melchior & Balthasar were first mentioned in the 6th Century. season is Candlemass day, which we will observe on the eve – 1st February – 40 days after Christmass Day. The Gospel for this feast proclaims the words of Simeon that the infant Jesus will be “a revealing light to the Gentiles” (Luke 2 v 32). The day is called Candlemass because candles are blessed before Mass and there is a procession around the church symbolising the way we should witness for Christ in the world. As we say at each Baptism – Shine as a light in the world to the glory of GOD the FATHER. All these feasts challenge us to be a light like the star of Bethelehem to point to Jesus, the light of the World, and to let His light and love shine through us to everyone with whom we come into contact.